We don't want to pat ourselves on the back too much, but just last week we did an in-depth piece on not just which hardware manufacturer is most likely to be Google's partner for the Nexus tablet, but which manufacturer should be chosen for the job. In that piece, we singled out Asus as the most deserving for the Nexus tablet job, and it looks like we might be right. As of now, it is still just a rumor, but word has it that Asus actually is the hardware partner for Google's upcoming $199 Nexus tablet. The new comes second-hand from the founder of Android and Me, Taylor Wimberly, who says that two trusted sources told him at Mobile World Congress that Asus is the hardware partner for Google on this project. If Taylor trusts the sources, we have no reason to doubt that they believe it to be true. Of course, we don't know exactly who the sources are, or where they got their info, so we have to file this as an unsubstantiated rumor at this point. But, with Google I/O just under 4 months away, we should have confirmed info soon enough. well...asus said it will be the first to try jelly bean It's obvious !!! 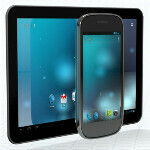 Jelly Bean will not be on the Nexus tablet. The Nexus tablet will likely be Android 4.1, which will still be ICS. Jelly Bean will be on the new Nexus phone in the fall. Also, Asus said it would be "in the first wave" with the Jelly Bean update, which just means that it will continue to be faster than everyone else with updates (like it was with ICS), because it doesn't skin or have carrier review delays. ^ THIS +1000 ^ BAM! If its true than I was completely wrong in my counter assessment. Going back n thinking about it after reading my old comments, I dont know why I skipped over Asus in my placement, but I sure as heck did. I would have put it sammy, asus, then huawei as the dark horse otherwise. Still wrong either way. :) As much as a nexus tablet sounds awesome, I need to know where its made. I know Asus has a lot of stuff made through foxconn, and im not about to buy that after all the hell I've been raising over apple MS and foxconn. hey, they deserve it alright. I felt the Transformer was the best Android tablet that was released last year. I think Google noticed as well. Asus was also quick to get updates out to their tablets. When i saw the title of the article, i knew Michael Heller was behind it. I'm kind of a fan boy of all of his articles and this one was no exception. If Asus is the developer of the Nexus tablet, i will be more than happy. Something would have to give for that to happen, and we both know it wouldn't be Google, and I doubt Amazon would do it. Gah, why can't I edit/delete my post! What I meant to say was, Asus is definitely the best Android maker atm and totally deserve to make this tablet. If only it came out sooner, because I'm planning on getting another Asus transformer in the mean time! Oh the irony! Man, that'd be so ideal. I think the padfone concept is amazing but not as well executed as i would've hoped. The phone is the weak-link here. But this really does seem like where the future is headed. I'm hoping Asus redoes the padfone but does something a little more refined. A combination of a Nexus tablet and a Nexus smartphone with a keyboard dock would be the greatest thing for Android.